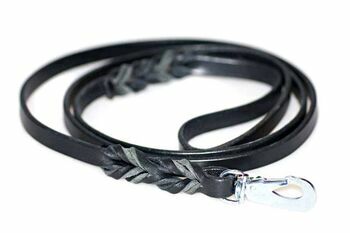 This is a 1.5 meter (5 ft) and 13 mm wide black leather dog lead made of full grain thick belting leather (4 mm thick). This dog lead has attractive handmade plaited detail instead of stitched leather. All Dog Moda's leather dog leads come with our special safety chrome coloured trigger hook which, unlike many inferior quality trigger hooks, will not open accidentally. This type of trigger hooks is used by husky teams and climbers in Scandinavia and is one of the safest design. These 1.5 meter (5 ft) long leather dog leads are very comfortable and light in your hands. 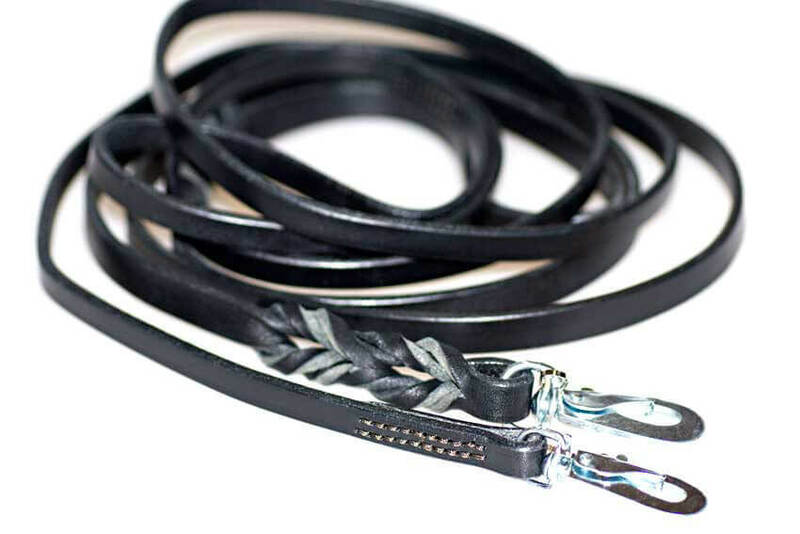 Overall a great everyday black leather lead combining top quality with a great price which will get better and better with use and will last you a lifetime. I just want to say a big thank you for so promptly sending me this lovely plaited leather lead. Also thank you for two reflector tags, very functional. Amazing and soft with the safety clip, unlike normal leads.